PWT 06, PA & Live Sound Accessory from Palmer. 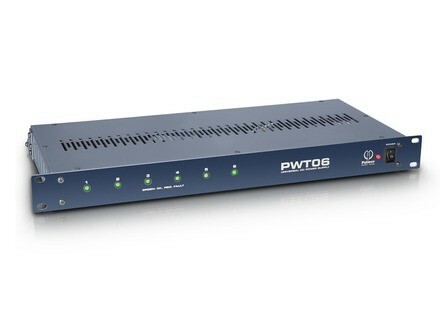 Palmer introduces the PTW06 19" rack multiple power supply for wireless receivers. The Palmer PWT06 is the solution to complex wireless systems using multiple power supplies, which causes cable clutter and frequent difficulties to solve failure issues. The device features six isolated 5.5 x 2.1 mm power sockets that deliver 1000 mA each. An output voltage of 9, 12 or 18 VDC can be selected for each connection; the polarity can also be set individually. Two-colored LEDs on the front panel indicate the correct supply voltage or possible improper settings. The PWT 06 is designed primarily for wireless systems and can supply DC current to up to 12 wireless receivers, e.g., the Sennheiser EM100G3, AKG 4500SET, Shure ULXP4, Line6 XDV75 or the receivers from LD Systems. The Palmer PWT 06 Multiple Power Supply comes complete with six Y DC cables that can supply power to two devices each via one output and a strain relief bar for organising and securing the cables. Additional information available at www.palmer-germany.com. 3 new Mackie SRM loudspeakers Mackie introduces the most powerful loudspeakers in the SRM Series, with two ampified full range/floor monitors and an amplified subwoofer. BassMaxx launches the DiaMon DJ112 monitor BassMaxx announces the release of the DiaMon DJ112 amplified stage monitor, a compact model designed for mobile DJs and musicians.